Information provided describes the symptoms, causes and treatments, with information on getting help and coping. Attention Deficit Hyperactivity Disorder (ADHD) is a condition that becomes apparent in some children in the preschool and early school years. It's hard for these children to control their behavior &/or pay attention. It's estimated that between 3 and 5% of children have ADHD, or approximately 2 million children in the United States. This means that in a classroom of 25 to 30 children, it's likely that at least one will have ADHD. ADHD was first described by Dr. Heinrich Hoffman in 1845. A physician who wrote books on medicine and psychiatry, Dr. Hoffman was also a poet who became interested in writing for children when he couldn't find suitable materials to read to his 3-year-old son. Since then, several thousand scientific papers on the disorder have been published, providing information on its nature, course, causes, impairments and treatments. A child with ADHD faces a difficult but not insurmountable task ahead. In order to achieve his or her full potential, he or she should receive help, guidance and understanding from parents, guidance counselors and the public education system. Following is information on ADHD and its management, including research on medications and behavioral interventions, as well as helpful resources on educational options. Not everyone who is overly hyperactive, inattentive or impulsive has ADHD. Since most people sometimes blurt out things they didn't mean to say, or jump from one task to another or become disorganized and forgetful, how can specialists tell if the problem is ADHD? Because everyone shows some of these behaviors at times, the diagnosis requires that such behavior be demonstrated to a degree that's inappropriate for the person's age. The diagnostic guidelines also contain specific requirements for determining when the symptoms indicate ADHD. So someone who shows some symptoms but whose schoolwork or friendships aren't impaired by these behaviors wouldn't be diagnosed with ADHD. Nor would a child who seems overly active on the playground but functions well elsewhere receive an ADHD diagnosis. Are these behaviors excessive, long-term and pervasive? That is, do they occur more often than in other children the same age? The person's pattern of behavior is compared against a set of criteria and characteristics of the disorder as listed in the DSM-IV-TR. Some parents see signs of inattention, hyperactivity and impulsivity in their toddler long before the child enters school. The child may lose interest in playing a game or watching a TV show or may run around completely out of control. But because children mature at different rates and are very different in personality, temperament and energy levels, it's useful to get an expert's opinion of whether the behavior is appropriate for the child's age. Parents can ask their child's pediatrician, or a child psychologist or psychiatrist, to assess whether their toddler has an attention deficit hyperactivity disorder or is, more likely at this age, just immature or unusually exuberant. ADHD may be suspected by a parent or caretaker or may go unnoticed until the child runs into problems at school. Given that ADHD tends to affect functioning most strongly in school, sometimes the teacher is the first to recognize that a child is hyperactive or inattentive and may point it out to the parents &/or consult with the school psychologist. Because teachers work with many children, they come to know how "average" children behave in learning situations that require attention and self-control. However, teachers sometimes fail to notice the needs of children who may be more inattentive and passive yet who are quiet and cooperative, such as those with the predominantly inattentive form of ADHD. Professionals Who Make the Diagnosis. Ideally, the diagnosis should be made by a professional in your area w/training in ADHD or in the diagnosis of mental disorders. Child psychiatrists and psychologists, developmental / behavioral pediatricians or behavioral neurologists are those most often trained in differential diagnosis. Clinical social workers may also have such training. The family can start by talking with the child's pediatrician or their family doctor. Some pediatricians may do the assessment themselves, but often they refer the family to an appropriate mental health specialist they know and trust. In addition, state and local agencies that serve families and children, as well as some of the volunteer organizations listed at the end of this document, can help identify appropriate specialists. Knowing the differences in qualifications and services can help the family choose someone who can best meet their needs. There are several types of specialists qualified to diagnose and treat ADHD. Child psychiatrists are doctors who specialize in diagnosing and treating childhood mental and behavioral disorders. A psychiatrist can provide therapy and prescribe any needed medications. Child psychologists are also qualified to diagnose and treat ADHD. They can provide therapy for the child and help the family develop ways to deal with the disorder. But psychologists aren't medical doctors and must rely on the child's physician to do medical exams and prescribe medication. Neurologists, doctors who work with disorders of the brain and nervous system, can also diagnose ADHD and prescribe medicines. But unlike psychiatrists and psychologists, neurologists usually don't provide therapy for the emotional aspects of the disorder. Ideally, in ruling out other causes, the specialist checks the child's school & medical records. There may be a school record of hearing or vision problems, since most schools automatically screen for these. The specialist tries to determine whether the home & classroom environments are unusually stressful or chaotic & how the child's parents & teachers deal w/the child. Next the specialist gathers information on the child's ongoing behavior in order to compare these behaviors to the symptoms & diagnostic criteria listed in the DSM-IV-TR. This also involves talking w/the child & if possible, observing the child in class & other settings. The child's teachers, past & present, are asked to rate their observations of the child's behavior on standardized evaluation forms, known as behavior rating scales, to compare the child's behavior to that of other children the same age. While rating scales might seem overly subjective, teachers often get to know so many children that their judgment of how a child compares to others is usually a reliable & valid measure. The specialist interviews the child's teachers & parents & may contact other people who know the child well, such as coaches or baby-sitters. Parents are asked to describe their child's behavior in a variety of situations. They may also fill out a rating scale to indicate how severe & frequent the behaviors seem to be. In most cases, the child will be evaluated for social adjustment & mental health. Tests of intelligence & learning achievement may be given to see if the child has a learning disability & whether the disability is in one or more subjects. In looking at the results of these various sources of information, the specialist pays special attention to the child's behavior during situations that are the most demanding of self-control, as well as noisy or unstructured situations such as parties, or during tasks that require sustained attention, like reading, working math problems or playing a board game. Behavior during free play or while getting individual attention is given less importance in the evaluation. In such situations, most children w/ADHD are able to control their behavior & perform better than in more restrictive situations. The specialist then pieces together a profile of the child's behavior. Which ADHD-like behaviors listed in the most recent DSM does the child show? How long has the child been doing them? How old was the child when the problem started? Are the behavior problems relatively chronic or enduring or are they periodic in nature? Are the behaviors seriously interfering w/the child's friendships, school activities, home life, or participation in community activities? Does the child have any other related problems? The answers to these questions help identify whether the child's hyperactivity, impulsivity & inattention are significant & long-standing. If so, the child may be diagnosed w/ADHD. A correct diagnosis often resolves confusion about the reasons for the child's problems that lets parents & child move forward in their lives w/more accurate information on what's wrong & what can be done to help. Once the disorder is diagnosed, the child & family can begin to receive whatever combination of educational, medical & emotional help they need. This may include providing recommendations to school staff, seeking out a more appropriate classroom setting, selecting the right medication & helping parents to manage their child's behavior. One of the first questions a parent will have is "Why? What went wrong?" "Did I do something to cause this?" There's little compelling evidence at this time that ADHD can arise purely from social factors or child-rearing methods. Most substantiated causes appear to fall in the realm of neurobiology & genetics. This isn't to say that environmental factors may not influence the severity of the disorder & especially the degree of impairment & suffering the child may experience, but that such factors don't seem to give rise to the condition by themselves. The parents' focus should be on looking forward & finding the best possible way to help their child. Scientists are studying causes in an effort to identify better ways to treat & perhaps someday, to prevent ADHD. They're finding more & more evidence that ADHD doesn't stem from the home environment, but from biological causes. Knowing this can remove a huge burden of guilt from parents who might blame themselves for their child's behavior. Over the last few decades, scientists have come up w/possible theories about what causes ADHD. Some of these theories have led to dead ends, some to exciting new avenues of investigation. Studies have shown a possible correlation between the use of cigarettes & alcohol during pregnancy & risk for ADHD in the offspring of that pregnancy. As a precaution, it's best during pregnancy to refrain from both cigarette & alcohol use. Another environmental agent that may be associated w/a higher risk of ADHD is high levels of lead in the bodies of young preschool children. Since lead is no longer allowed in paint & is usually found only in older buildings, exposure to toxic levels isn't as prevalent as it once was. Children who live in old buildings in which lead still exists in the plumbing or in lead paint that has been painted over may be at risk. One early theory was that attention disorders were caused by brain injury. Some children who've suffered accidents leading to brain injury may show some signs of behavior similar to that of ADHD, but only a small percentage of children w/ADHD have been found to have suffered a traumatic brain injury. It's been suggested that attention disorders are caused by refined sugar or food additives, or that symptoms of ADHD are exacerbated by sugar or food additives. In another study, children whose mothers felt they were sugar-sensitive were given aspartame as a substitute for sugar. Half the mothers were told their children were given sugar, half that their children were given aspartame. Some knowledge of the structure of the brain is helpful in understanding the research scientists are doing in searching for a physical basis for attention deficit hyperactivity disorder. One part of the brain that scientists have focused on in their search is the frontal lobes of the cerebrum. The frontal lobes allow us to solve problems, plan ahead, understand the behavior of others & restrain our impulses. The two frontal lobes, the right & the left, communicate w/each other thru the corpus callosum, (nerve fibers that connect the right & left frontal lobes). The basal ganglia are the interconnected gray masses deep in the cerebral hemisphere that serve as the connection between the cerebrum & the cerebellum & w/the cerebellum, are responsible for motor coordination. 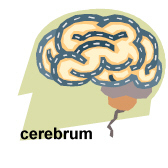 The cerebellum is divided into 3 parts. The middle part is called the vermis. All of these parts of the brain have been studied thru the use of various methods for seeing into or imaging the brain. These methods include functional magnetic resonance imaging (fMRI) positron emission tomography (PET) & single photon emission computed tomography (SPECT). The main or central psychological deficits in those w/ADHD have been linked thru these studies. By 2002 the researchers in the NIMH Child Psychiatry Branch had studied 152 boys & girls w/ADHD, matched w/139 age & gender -matched controls w/out ADHD. The children were scanned at least twice, some as many as 4 times over a decade. As a group, the ADHD children showed 3-4% smaller brain volumes in all regions - the frontal lobes, temporal gray matter, caudate nucleus & cerebellum. Although this long-term study used MRI to scan the children's brains, the researchers stressed that MRI remains a research tool & can't be used to diagnose ADHD in any given child. This is true for other neurological methods of evaluating the brain, such as PET & SPECT. Every family wants to determine what treatment will be most effective for their child. This question needs to be answered by each family in consultation w/their health care professional. To help families make this important decision, the National Institute of Mental Health (NIMH) has funded many studies of treatments for ADHD & has conducted the most intensive study ever undertaken for evaluating the treatment of this disorder. This study is known as the Multimodal Treatment Study of Children w/ Attention Deficit Hyperactivity Disorder (MTA).12 The NIMH is now conducting a clinical trial for younger children ages 3 to 5.5 years (Treatment of ADHD in Preschool-Age Children). The Multimodal Treatment Study of Children with Attention Deficit Hyperactivity Disorder. In each of the study sites, 3 groups were treated for the first 14 months in a specified protocol & the 4th group was referred for community treatment of the parents' choosing. All of the children were reassessed regularly throughout the study period. An essential part of the program was the cooperation of the schools, including principals & teachers. Both teachers & parents rated the children on hyperactivity, impulsivity & inattention & symptoms of anxiety & depression, as well as social skills. The physicians, in addition, sought input from the teachers on a monthly basis. The physicians in the medication - only group didn't provide behavioral therapy but did advise the parents when necessary concerning any problems the child might have. In the behavior treatment-only group, families met up to 35 times w/a behavior therapist, mostly in group sessions. These therapists also made repeated visits to schools to consult w/children's teachers & to supervise a special aide assigned to each child in the group. In addition, children attended a special 8-week summer treatment program where they worked on academic, social & sports skills & where intensive behavioral therapy was delivered to assist children in improving their behavior. In routine community care, the children saw the community-treatment doctor of their parents' choice 1 to 2 times per year for short periods of time. Also, the community-treatment doctor didn't have any interaction w/the teachers. The results of the study indicated that long-term combination treatments & the medication-management alone were superior to intensive behavioral treatment & routine community treatment. And in some areas, anxiety, academic performance, oppositionality, parent-child relations & social skills; the combined treatment was usually superior. Another advantage of combined treatment was that children could be successfully treated w/lower doses of medicine, compared w/the medication-only group. Treatment of Attention Deficit Hyperactivity Disorder in Preschool-Age Children (PATS). Because many children in the preschool years are diagnosed w/ ADHD & are given medication, it's important to know the safety & efficacy of such treatment. The NIMH is sponsoring an ongoing multi-site study, "Preschool ADHD Treatment Study" (PATS). It's the first major effort to examine the safety & efficacy of a stimulant, methylphenidate, for ADHD in this age group. The PATS study uses a randomized, placebo-controlled, double-blind design. Children ages 3 to 5 who have severe & persistent symptoms of ADHD that impair their functioning are eligible for this study. To avoid using medications at such an early age, all children who enter the study are first treated w/behavioral therapy. Only children who don't show sufficient improvement w/behavior therapy are considered for the medication part of the study. The study is being conducted at New York State Psychiatric Institute, Duke University, Johns Hopkins University, New York University, the University of California at Los Angeles & the University of California at Irvine. Enrollment in the study will total 165 children. For children w/ADHD, no single treatment is the answer for every child. A child may sometimes have undesirable side effects to a medication that would make that particular treatment unacceptable. And if a child w/ADHD also has anxiety or depression, a treatment combining medication & behavioral therapy might be best. Each child's needs & personal history must be carefully considered. The medications that seem to be the most effective are a class of drugs known as stimulants. Following is a list of the stimulants, their trade (or brand) names & their generic names. "Approved age" means that the drug has been tested & found safe & effective in children of that age. The U.S. Food and Drug Adminstration (FDA) recently approved a medication for ADHD that isn't a stimulant. The medication, Strattera®, or atomoxetine, works on the neurotransmitter norepinephrine, whereas the stimulants primarily work on dopamine. Both of theses neurotransmitters are believed to play a role in ADHD. More studies will need to be done to contrast Strattera w/the medications already available, but the evidence to date indicates that over 70% of children w/ADHD given Strattera manifest significant improvement in their symptoms. Some people get better results from one medication, some from another. It's important to work w/the prescribing physician to find the right medication & the right dosage. For many people, the stimulants dramatically reduce their hyperactivity & impulsivity & improve their ability to focus, work & learn. The medications may also improve physical coordination, such as that needed in handwriting & in sports. The stimulant drugs, when used w/medical supervision, are usually considered quite safe. Stimulants don't make the child feel "high," although some children say they feel different or funny. Such changes are usually very minor. Although some parents worry that their child may become addicted to the medication, to date there's no convincing evidence that stimulant medications, when used for treatment of ADHD, cause drug abuse or dependence. The stimulant drugs come in long & short-term forms. The newer sustained-release stimulants can be taken before school & are long-lasting so that the child doesn't need to go to the school nurse every day for a pill. The doctor can discuss w/the parents the child's needs & decide which preparation to use & whether the child needs to take the medicine during school hours only or in the evening & on weekends too. If the child doesn't show symptom improvement after taking a medication for a week, the doctor may try adjusting the dosage. If there's still no improvement, the child may be switched to another medication. About 1 out of 10 children isn't helped by a stimulant medication. Other types of medication may be used if stimulants don't work or if the ADHD occurs w/another disorder. Antidepressants & other medications can help control accompanying depression or anxiety. Sometimes the doctor may prescribe for a young child a medication that has been approved by the FDA for use in adults or older children. This use of the medication is called "off label." Many of the newer medications that are proving helpful for child mental disorders are prescribed off label because only a few of them have been systematically studied for safety & efficacy in children. Medications that haven't undergone such testing are dispensed w/ the statement that "safety & efficacy haven't been established in pediatric patients." Appetite seems to fluctuate, usually being low during the middle of the day & more normal by suppertime. Adequate amounts of food that is nutritional should be available for the child, especially at peak appetite times. If the child has difficulty falling asleep, several options may be tried; a lower dosage of the stimulant, giving the stimulant earlier in the day, discontinuing the afternoon or evening dosage, or giving an adjunct medication such as a low-dosage antidepressant or clonidine. A few children develop tics during treatment. These can often be lessened by changing the medication dosage. A very few children can't tolerate any stimulant, no matter how low the dosage. In such cases, the child is often given an antidepressant instead of the stimulant. When a child's schoolwork and behavior improve soon after starting medication, the child, parents and teachers tend to applaud the drug for causing the sudden changes. Unfortunately, when people see such immediate improvement, they often think medication is all that's needed. But medications don't cure ADHD; they only control the symptoms on the day they're taken. Although the medications help the child pay better attention and complete school work, they can't increase knowledge or improve academic skills. The medications help the child to use those skills he or she already possesses. Behavioral therapy, emotional counseling and practical support will help ADHD children cope with everyday problems and feel better about themselves. Medications for ADHD help many children focus and be more successful at school, home and play. Avoiding negative experiences now may actually help prevent addictions and other emotional problems later. About 80% of children who need medication for ADHD still need it as teenagers. Over 50% need medication as adults. Health experts say that ADHD (attention deficit hyperactivity disorder) is the most common behavioral disorder that starts during childhood. However, it does not only affect children - people of all ages can suffer from ADHD. Psychiatrists say ADHD is a neurobehavioral developmental disorder. An individual with ADHD finds it much more difficult to focus on something without being distracted. He has greater difficulty in controlling what he is doing or saying and is less able to control how much physical activity is appropriate for a particular situation compared to somebody without ADHD. In other words, a person with ADHD is much more impulsive and restless. Health care professionals may use any of the following terms when describing a child (or an older person) who is overactive and has difficulty concentrating - attention deficit, attention deficit hyperactivity disorder, hyperkinetic disorder, hyperactivity. The Centers for Disease Control and Prevention (CDC) estimates that approximately 4.4 million children aged 4 to 17 have been diagnosed with ADHD in the USA by a healthcare professional. As of 2003 2 1/2 million American children aged 4 to 17 are being treated for ADHD with medicines. The CDC adds that in 2003 7.8% of all school-aged American children were reported to have an ADHD diagnosis by their parent. According to the CDC, there are three types of ADHD. They are defined according to which symptoms stand out the most. They have difficulty waiting their turn and find it hard to listen to directions. A person with this type of ADHD will have more injuries and/or accidents than others. A person whose symptoms include all those of 1 and 2, and whose symptoms are equally predominant. In other words, all the symptoms in 1 and 2 stand out equally. What are the general signs of ADHD in children? The above signs may be observed in children frequently and usually do not mean the child has ADHD. It is when these signs become significantly more pronounced in one child, compared to other children of the same age, and when his/her behavior undermines his/her school and social life, that the child may have ADHD. We are not sure. Studies reveal that a person's risk of developing ADHD is higher if a close relative also has/had it. Twin studies have indicated that ADHD is highly heritable. We also know that ADHD is much more common in boys than girls. The scientific community generally agrees that ADHD is biological in nature. Many reputable scientists believe ADHD is the result of chemical imbalances in the brain. Some studies have indicated that food additives, specifically some colorings, may have an impact on ADHD behaviors. In July 2008, the European Union ruled that synthetic food colorings (called azo dyes) must be labeled not only with the relevant E number, but also with the words "may have an adverse effect on activity and attention in children". A 1984 study by Benton and team, demonstrated that sugar has no effect on behavior. A study in 1986 by Milich and Pelham, and another by Wolraich and team in 1985, also found no link between sucrose (sugar) and behavior impact on children with ADHD. However, most sugars found in sugary foods and sweets (candy) consumed by children are corn syrup and high fructose corn syrup - these sugars were not used in any of the above-mentioned studies. How do I know if I, my child, spouse or relative has ADHD? ADHD cannot be diagnosed physically, i.e. with a blood test, urine test, brain scan or a physical check up. As most children have problems with self-control anyway, a proper diagnosis can be quite challenging. An ADHD diagnosis has to be carried out by a specialist - usually a psychiatrist, psychologist or pediatrician. The specialist will observe the child and recognize behavior patterns. Data regarding the child's behavior at home and at school will also be studied. Only a specialist will be able to accurately detect whether other problems and/or conditions are resulting in ADHD-like behavioral characteristics. If you do not know how to find a specialist, ask your GP. When does ADHD start? How long does ADHD last? According to New Zealand's ADHD Online Support Group, the onset of ADHD usually occurs before the person is 7 years old. For about 75% of ADHD sufferers, symptoms continue into adulthood. However, levels of hyperactivity tend to decrease as the person gets older. For children with Attention Deficit Hyperactivity Disorder (ADHD) tasks that require concentration such as doing homework or taking a test can be very difficult. A simple, inexpensive remedy may be a "dose of nature." "From our previous research, we knew there might be a link between spending time in nature and reduced ADHD symptoms," said Faber Taylor. "So to confirm that link we conducted a study in which we took children on walks in three different settings - one especially "green" and two less "green" - and kept everything about the walks as similar as possible." "What this particular study tells us is that the physical environment matters," said Kuo. "We don't know what it is about the park, exactly - the greenness or lack of buildings - that seems to improve attention, but the study tells us that even though everything else was the same - who the child was with, the levels of noise, the length of time, the time of day, whether the child was on medication - if we kept everything else the same, we just changed the environment, we still saw a measurable difference in children's symptoms. And that's completely new. No one has done a study looking at a child in different environments, in a controlled comparison where everything else is the same." The sample size was relatively small - only 17 children - mostly because the logistics were a nightmare to coordinate. "Because we kept everything the same, the children all went to the same park and walked through the same neighborhood and downtown area. The testing location had to be close by so that there wasn't a lot of lag time between going for the walk and taking the post-test," said Faber Taylor. "And each child was always paired with the same adult guide for their walks, and all the children were tested by the same tester." Kuo said that the variables of the study were very hard to control. "We started with a much larger sample size. But when we threw out all of the things that could go wrong - the weather wasn't good one day, the child came late, or came medicated - when we threw out all of those, it left us with this relatively pure, clean sample to work with." She said that while there are hints that the regular doses of nature work long term - that you can expose a child to the same green outdoor settings day after day and still get a benefit - the science isn't advanced enough to give parents a strict formula. "We can't say for sure, 'two hours of outdoor play will get you this many days of good behavior,' but we can say it's worth trying, and we can say that as little as 20 minutes of outdoor exposure could potentially buy you an afternoon or a couple of hours to get homework done," said Kuo. "One reason we believe this is that if the effect were short-lived, we don't think that parents would have so consistently observed it. But they do. They report it over and over. And they report it independently. So, in the larger study with over 450 kids, we asked 'what's your kid like after watching TV or after playing outside' and none of the parents know what any of the other parents are telling us, but they overwhelmingly agree." Faber Taylor believes it would be easy to add a dose of nature to a child's routine. "I could imagine parents hearing about this research and immediately applying it - just trying it out - taking their child to the park either when their child's symptoms are exacerbated or as a regular routine. It's not that hard to incorporate, especially if they have a green backyard or if they can get to a neighborhood park. Again, we can't say for sure that it would work for any given child - but there's probably very little risk involved in encouraging your child to play outdoors and seeing if their symptoms improve." She also says that the benefits of a dose of nature don't apply just to children with ADHD. "We're all on a continuum of attention so this study has implications for all of us," said Taylor. "ADHD is just at the far end of attention functioning, but there're plenty of us who fall somewhere close to that end of the continuum, and we all experience times when we're mentally fatigued - times when we're less able to focus and do tasks and get easily distracted. The evidence suggests that natural settings can benefit everyone, even children (and adults) who have not been diagnosed with ADHD." The Transcendental Meditation technique may be an effective and safe non-pharmaceutical aid for treating ADHD, according to a promising new study published this month in the peer-reviewed online journal Current Issues in Education. The pilot study followed a group of middle school students with ADHD who were meditating twice a day in school. After three months, researchers found over 50 percent reduction in stress and anxiety and improvements in ADHD symptoms. Prior research shows ADHD children have slower brain development and a reduced ability to cope with stress. "Stress interferes with the ability to learn - it shuts down the brain," said William Stixrud, Ph.D., a Silver Spring, Maryland, clinical neuropsychologist and co-author of the study. "Medication for ADHD is very effective for some children, but it is marginally or not effective for others. Even for those children who show improved symptoms with the medication, the improvement is often insufficient or accompanied by troubling side effects," Stixrud said. "Virtually everyone finds it difficult to pay attention, organize themselves and get things done when they're under stress. So it stands to reason that the TM technique which reduces stress and organizes brain function would reduce ADHD symptoms." While in some cases a child cannot function without medication, there is growing concern about the health risks and side effects associated with the common ADHD medications, including mood swings, insomnia, tics, slowed growth, and heart problems. In 2006 the FDA required manufacturers to place warning labels on ADHD medications, listing the potential serious health risks. The study was conducted in a private K-12 school for children with language-based learning disabilities. Participation was restricted to 10 students, ages 11-14, who had pre-existing diagnoses of ADHD. About half of the students were on medication. The students meditated at school in a group for 10 minutes, morning and afternoon. To determine the influence of the TM technique, at the beginning and end of the three-month period, parents, teachers and students completed standard ADHD assessment inventories measuring stress and anxiety, behavior and social competency, and executive function. Students were also given a battery of performance tests to measure cognitive functioning. "The results were quite remarkable"
Andy and Daryl Schoenbach's daughter was diagnosed with ADHD in second grade. Like most ADHD children she was taking medication. "The medication helped but had mixed results - she still lost focus, had meltdowns, and the medications affected her sleep and appetite," said Andy, who lives with Daryl in Washington D.C. "She was not performing close to her potential and we didn't see the situation improving. So at the end of seventh grade when her doctor recommended increasing the medication, we decided it was time to take a different course - stopping the medication and using Transcendental Meditation." "The results were quite remarkable," Daryl said. "The twice daily meditations smoothed things out, gave her perspective, and enabled her to be in greater control of her own life when things started falling apart. It took some time, but it gradually changed the way she handled crises and enabled her to feel confident that she could take on greater challenges - in her own words, 'climb a mountain.'" "Everyone noticed the change," Andy added. Grosswald explained that there is substantial research showing the effectiveness of the TM technique for reducing stress and anxiety, and improving cognitive functioning among the general population. "What's significant about these new findings is that among children who have difficulty with focus and attention, we see the same results. TM doesn't require concentration, controlling the mind or disciplined focus. The fact that these children are able to do TM, and do it easily shows us that this technique may be particularly well suited for children with ADHD," she said. This study was funded by the Abramson Family Foundation and the Institute for Community Enrichment. A second, recently completed TM-ADHD study with a control group measured brain function using electroencephalography (EEG). Preliminary data shows that three months practice of the technique resulted in significant positive changes in brain functioning during visual-motor skills. Changes were specifically seen in the circuitry of the brain associated with attention and distractibility. After six months TM practice, measurements of distractibility moved into the normal range. A third TM-ADHD study, to be funded by a $2 million grant from the David Lynch Foundation, will more fully investigate the effects of the technique on ADHD and other learning disorders. -- The Center for Disease Control reports that nearly 50 percent of the 4.5 million children (ages 4-17) in the United States diagnosed with ADHD are on ADHD medication - and the majority of those on medication stay on it in adulthood. -- The rate of prescriptions for Attention Deficit Hyperactivity Disorder in the U.S. has increasing by a factor of five since 1991 - with production of ADHD medicines up 2,000 percent in 9 years. -- The commonly used drugs for ADHD are stimulants (amphetamines). These drugs can cause persistent and negative side effects, including sleep disturbances, reduced appetite, weight loss, suppressed growth, and mood disorders. The side effects are frequently treated with additional medications to manage insomnia or mood swings. Almost none of the medications prescribed for insomnia or mood disturbances are approved by the Food and Drug Administration (FDA) for use with children. -- The long-term health effects of ADHD medications are not fully known, but evidence suggests risks of cardiac disorders and sudden death, liver damage and psychiatric events. It has also been found that children on long-term medication have significantly higher rates of delinquency, substance use, and stunted physical growth. -- The Transcendental Meditation technique is an effortless technique practiced 10-20 minutes twice a day sitting comfortably with the eyes closed. -- TM is not a religion or philosophy and involves no new beliefs or change in lifestyle. -- Over 350 peer-reviewed research studies on the TM technique confirm a range of benefits for mind, body and behavior. -- Several studies have compared the effects of different meditation practices and found that Transcendental Meditation provides deeper relaxation and is more effective at reducing anxiety, depression and hypertension than other forms of meditation and relaxation. In addition, no other meditation practice shows the widespread coherence throughout all areas the brain that is seen with Transcendental Meditation. -- The Transcendental Meditation technique is taught in the United States by a non-profit, educational organization. -- More information can be obtained by calling 888-LEARN-TM or visiting http://www.ADHD-TM.org, http://www.AskTheDoctors.com, or http://www.TMEducation.org. There is an enormous source of information I just found that I'd like to offer for you... click here and notice at the bottom of the list there are additional pages to click on for a total of 8 pages of articles concerning this topic! These symptoms appear early in a child's life. Because many normal children may have these symptoms, but at a low level, or the symptoms may be caused by another disorder, it's important that the child receive a thorough examination and appropriate diagnosis by a well-qualified professional. Symptoms of ADHD will appear over the course of many months, often with the symptoms of impulsiveness and hyperactivity preceding those of inattention, which may not emerge for a year or more. Different symptoms may appear in different settings, depending on the demands the situation may pose for the child's self-control. A child who "can't sit still" or is otherwise disruptive will be noticeable in school, but the inattentive daydreamer may be overlooked. The impulsive child who acts before thinking may be considered just a "discipline problem," while the child who is passive or sluggish may be viewed as merely unmotivated. Yet both may have different types of ADHD. All children are sometimes restless, sometimes act without thinking, sometimes daydream the time away. When the child's hyperactivity, distractibility, poor concentration or impulsivity begin to affect performance in school, social relationships with other children or behavior at home, ADHD may be suspected. But because the symptoms vary so much across settings, ADHD is not easy to diagnose. This is especially true when inattentiveness is the primary symptom. According to the most recent version of the Diagnostic and Statistical Manual of Mental Disorders2 (DSM-IV-TR), there are 3 patterns of behavior that indicate ADHD. People with ADHD may show several signs of being consistently inattentive. They may have a pattern of being hyperactive and impulsive far more than others of their age. Or they may show all three types of behavior. This means that there are 3 subtypes of ADHD recognized by professionals. combined type (that displays both inattentive and hyperactive-impulsive symptoms). Impulsive children seem unable to curb their immediate reactions or think before they act. They'll often blurt out inappropriate comments, display their emotions without restraint and act without regard for the later consequences of their conduct. Their impulsivity may make it hard for them to wait for things they want or to take their turn in games. They may grab a toy from another child or hit when they're upset. Even as teenagers or adults, they may impulsively choose to do things that have an immediate but small payoff rather than engage in activities that may take more effort yet provide much greater but delayed rewards. Children who are inattentive have a hard time keeping their minds on any one thing and may get bored with a task after only a few minutes. If they're doing something they really enjoy, they have no trouble paying attention. But focusing deliberate, conscious attention to organizing and completing a task or learning something new is difficult. Homework is particularly hard for these children. They'll forget to write down an assignment or leave it at school. They'll forget to bring a book home or bring the wrong one. The homework, if finally finished, is full of errors and erasures. Homework is often accompanied by frustration for both parent and child. They may have difficulty processing information as quickly and accurately as other children. When the teacher gives oral or even written instructions, this child has a hard time understanding what he or she is supposed to do and makes frequent mistakes. Yet the child may sit quietly, unobtrusively and even appear to be working but not fully attending to or understanding the task and the instructions. These children don't show significant problems with impulsivity and overactivity in the classroom, on the school ground, or at home. They may get along better w/other children than the more impulsive and hyperactive types of ADHD and they may not have the same sorts of social problems so common with the combined type of ADHD. So often their problems with inattention are overlooked. But they need help just as much as children with other types of ADHD, who cause more obvious problems in the classroom. Parents should not worry when their pre-schoolers talk to themselves; in fact, they should encourage it, says Adam Winsler, an associate professor of psychology at George Mason University. His recent study published in Early Childhood Research Quarterly showed that 5-year-olds do better on motor tasks when they talk to themselves out loud (either spontaneously or when told to do so by an adult) than when they are silent. "Young children often talk to themselves as they go about their daily activities, and parents and teachers shouldn't think of this as weird or bad," says Winsler. "On the contrary, they should listen to the private speech of kids. It's a fantastic window into the minds of children." In the study, "'Should I let them talk? ': Private speech and task performance among preschool children with and without behavior problems," 78% of the children performed either the same or better on the performance task when speaking to themselves than when they were silent. The study also showed that children with behavioral problems (such as those diagnosed with Attention Deficit Hyperactivity Disorder, or ADHD) tend to talk to themselves more often than children without signs of behavior problems. "Given that kids with behavior concerns need more direction and control from adults, teachers may unnecessarily ask children to be quiet in classrooms out of fear that such speech coming from difficult-to-manage kids will lead to problem behavior," says Winsler. "Yet non-disruptive private speech would actually help these children as they develop. Therefore, teacher training and professional development efforts should suggest that teachers increase their tolerance level for this kind of private speech." Winsler says that private speech is very common and perfectly normal among children between the ages of 2 and 5. As children begin talking to themselves, their communication skills with the outside world improve. "This is when language comes inside," says Winsler. "As these two communication processes merge, children use private speech in the transition period. It's a critical period for children, and defines us as human beings." Winsler also conducted the first-ever study looking at private speech in children with autism. He found that high-functioning autistic children talk to themselves often and in the same ways that non-autistic children do. Talking aloud also improved their performance on tasks. "Children with autism have problems with their external social speech, so psychologists assumed that their private speech would also be impaired," says Winsler. "But this study shows that it is not the case - that autistic children use their private speech very effectively as a tool to help them with tasks." The study, "Private Speech and Executive Functioning among High-Functioning Children with Autistic Spectrum Disorders," was just published in the Journal of Autism and Developmental Disabilities. George Mason University, located in the heart of Northern Virginia's technology corridor near Washington, D.C., is an innovative, entrepreneurial institution with national distinction in a range of academic fields. With strong undergraduate and graduate degree programs in engineering, information technology, biotechnology and health care, Mason prepares its students to succeed in the work force and meet the needs of the region and the world. Mason professors conduct groundbreaking research in areas such as cancer, climate change, information technology and the biosciences, and Mason's Center for the Arts brings world-renowned artists, musicians and actors to its stage. Its School of Law is recognized by U.S. News & World Report as one of the top 35 law schools in the United States. Many children w/ADHD, approximately 20 to 30%, also have a specific learning disability (LD).10 In preschool years, these disabilities include difficulty in understanding certain sounds or words &/or difficulty in expressing oneself in words. In school age children, reading or spelling disabilities, writing disorders & arithmetic disorders may appear. A type of reading disorder, dyslexia, is quite widespread. Reading disabilities affect up to 8% of elementary school children. A very small proportion of people w/ADHD have a neurological disorder called Tourette syndrome. People w/Tourette syndrome have various nervous tics & repetitive mannerisms, such as eye blinks, facial twitches or grimacing. Others may clear their throats frequently, snort, sniff or bark out words. These behaviors can be controlled w/medication. While very few children have this syndrome, many of the cases of Tourette syndrome have associated ADHD. In such cases, both disorders often require treatment that may include medications. As many as 1/3 to 1/2f of all children w/ADHD - mostly boys - have another condition, known as oppositional defiant disorder (ODD). They argue w/adults & refuse to obey. About 20 to 40% of ADHD children may eventually develop conduct disorder (CD), a more serious pattern of antisocial behavior. These children frequently lie or steal, fight w/or bully others & are at a real risk of getting into trouble at school or w/the police. These children or teens are at greater risk for substance use experimentation & later dependence & abuse. They need immediate help. Some children w/ADHD often have co-occurring anxiety or depression. If the anxiety or depression is recognized & treated, the child will be better able to handle the problems that accompany ADHD. Conversely, effective treatment of ADHD can have a positive impact on anxiety as the child is better able to master academic tasks. There are no accurate statistics on how many children w/ADHD also have bipolar disorder. Differentiating between ADHD & bipolar disorder in childhood can be difficult. In its classic form, bipolar disorder is characterized by mood cycling between periods of intense highs & lows. But in children, bipolar disorder often seems to be a rather chronic mood dysregulation w/a mixture of elation, depression & irritability. Medication can help the ADHD child in everyday life. He or she may be better able to control some of the behavior problems that have led to trouble w/parents & siblings. But it takes time to undo the frustration, blame & anger that may have gone on for so long. Both parents and children may need special help to develop techniques for managing the patterns of behavior. In such cases, mental health professionals can counsel the child & the family, helping them to develop new skills, attitudes & ways of relating to each other. In individual counseling, the therapist helps children w/ADHD learn to feel better about themselves. The therapist can also help them to identify & build on their strengths, cope w/daily problems & control their attention & aggression. Sometimes only the child w/ADHD needs counseling support. But in many cases, because the problem affects the family as a whole, the entire family may need help. The therapist assists the family in finding better ways to handle the disruptive behaviors & promote change. If the child is young, most of the therapist's work is w/the parents, teaching them techniques for coping with & improving their child's behavior. Psychotherapy works to help people w/ADHD to like & accept themselves despite their disorder. It doesn't address the symptoms or underlying causes of the disorder. In psychotherapy, patients talk w/the therapist about upsetting thoughts & feelings, explore self-defeating patterns of behavior & learn alternative ways to handle their emotions. As they talk, the therapist tries to help them understand how they can change or better cope w/their disorder. Behavioral therapy (BT) helps people develop more effective ways to work on immediate issues. Rather than helping the child understand his or her feelings & actions, it helps directly in changing their thinking & coping & thus may lead to changes in behavior. The support might be practical assistance, like help in organizing tasks or schoolwork or dealing w/emotionally charged events. Or the support might be in self-monitoring one's own behavior & giving self-praise or rewards for acting in a desired way such as controlling anger or thinking before acting. then gives children a chance to practice. i.e., a child might learn to "read" other people's facial expression & tone of voice in order to respond appropriately. Social skills training helps the child to develop better ways to play & work w/other children. Support groups help parents connect w/other people who have similar problems & concerns w/their ADHD children. Members of support groups often meet on a regular basis (such as monthly) to hear lectures from experts on ADHD, share frustrations & successes & obtain referrals to qualified specialists & information about what works. There's strength in numbers & sharing experiences w/others who have similar problems helps people know that they aren't alone. Parenting skills training, offered by therapists or in special classes, gives parents tools & techniques for managing their child's behavior. One such technique is the use of token or point systems for immediately rewarding good behavior or work. Another is the use of "time-out" or isolation to a chair or bedroom when the child becomes too unruly or out of control. During time-outs, the child is removed from the agitating situation & sits alone quietly for a short time to calm down. Parents may also be taught to give the child "quality time" each day, in which they share a pleasurable or relaxing activity. During this time together, the parent looks for opportunities to notice & point out what the child does well & praise his or her strengths & abilities. The child is told exactly what's expected in order to earn the reward. The child receives the reward when he performs the desired behavior & a mild penalty when he doesn't. A reward can be small, perhaps a token that can be exchanged for special privileges, but it should be something the child wants & is eager to earn. The penalty might be removal of a token or a brief time-out. Make an effort to find your child being good. The goal, over time, is to help children learn to control their own behavior & to choose the more desired behavior. The technique works well w/all children, although children w/ADHD may need more frequent rewards. In addition, parents may learn to structure situations in ways that will allow their child to succeed. This may include allowing only one or two playmates at a time, so that their child doesn't get overstimulated. Or if their child has trouble completing tasks, they may learn to help the child divide a large task into small steps, then praise the child as each step is completed. Parents may also learn to use stress management methods, such as meditation, relaxation techniques & exercise, to increase their own tolerance for frustration so that they can respond more calmly to their child's behavior. Schedule. Have the same routine every day, from wake-up time to bedtime. The schedule should include homework time and playtime (including outdoor recreation and indoor activities such as computer games). Have the schedule on the refrigerator or a bulletin board in the kitchen. If a schedule change must be made, make it as far in advance as possible. Organize needed everyday items. Have a place for everything and keep everything in its place. This includes clothing, backpacks, and school supplies. Use homework and notebook organizers. Stress the importance of writing down assignments and bringing home needed books. You are your child's best advocate. To be a good advocate for your child, learn as much as you can about ADHD & how it affects your child at home, in school & in social situations. If your child has shown symptoms of ADHD from an early age & has been evaluated, diagnosed & treated w/either behavior modification or medication or a combination of both, when your child enters the school system, let his or her teachers know. They'll be better prepared to help the child come into this new world away from home. If your child enters school & experiences difficulties that lead you to suspect that he or she has ADHD, you can either seek the services of an outside professional or you can ask the local school district to conduct an evaluation. Some parents prefer to go to a professional of their own choice. But it's the school's obligation to evaluate children that they suspect have ADHD or some other disability that's affecting not only their academic work but their interactions w/classmates & teachers. If you feel that your child has ADHD & isn't learning in school as he or she should, you should find out just who in the school system you should contact. Your child's teacher should be able to help you w/this information. Then you can request, in writing, that the school system evaluate your child. The letter should include the date, your & your child's names & the reason for requesting an evaluation. Keep a copy of the letter in your own files. Until the last few years, many school systems were reluctant to evaluate a child w/ADHD. But recent laws have made clear the school's obligation to the child suspected of having ADHD that's affecting adversely his or her performance in school. If the school persists in refusing to evaluate your child, you can either get a private evaluation or enlist some help in negotiating w/the school. Help is often as close as a local parent group. Once your child has been diagnosed w/ADHD & qualifies for special education services, the school, working w/you, must assess the child's strengths & weaknesses & design an Individualized Educational Program (IEP). You should be able periodically to review & approve your child's IEP. Each school year brings a new teacher & new schoolwork, a transition that can be quite difficult for the child w/ADHD. Your child needs lots of support & encouragement at this time. Never forget the cardinal rule: you're your child's best advocate. Does the homework battle so typical with your hyperactive or A.D.D. child have you at the end of your rope? Relax. We have some tried-and-try ADHD information that should get your A.D.D. child on the right homework path. The hyperactive or A.D.D. child especially needs consistency, a work place free of distractions, solid encouragement and praise - along with established consequences if the positive homework tips fail. Because the A.D.D. child functions best in a consistent environment, homework should be done in the same place, at the same time and for a set amount of time every day. Work with your child to develop that routine. Some Attention Deficit and hyperactive children work best immediately after school while others need an hour or two to settle down before jumping back into studies. To help the A.D.D. child better focus, the work area should be free of distractions, such as televisions, video games, music and other people. The kitchen table might not be the best place if there is too much activity in that room. The bedroom can offer distractions if the television or stereo have a way of "turning themselves on" when you are not there to monitor. We are strong proponents of establishing an allotted amount of homework time on school days. This set amount of time gives consistency to the hyperactive or A.D.D. child and discourages rushing through homework. Talk with your child's teachers about the average recommended homework time for the child's grade level. In general, elementary school children should spend about 30 minutes each night on homework. Middle school and high school students should spend about one hour on homework. If the child does not have homework that evening or they finish before the allotted time, the child can read until their mandatory homework time is over. The hyperactive and A.D.D. child often experiences difficulty with long-range tasks. "Chunking" homework for the hyperactive or A.D.D. child helps break the homework task into smaller, more manageable pieces. You can break a 20-problem math assignment into four chunks of five problems each, with a small break in between chunks. If using the mandatory homework time schedule, set a kitchen timer to ring every five to 15 minutes, depending on the child's attention span. At every break, give your hyperactive or A.D.D. child a few minutes to move around or grab a snack to refocus their attention. As with any parenting issue, rewarding good behavior and disciplining poor behavior motivates kids toward good behavior. The A.D.D. child needs all the rewards they can get, along with firm and consistent consequences. A “homework contract” is an effective motivator for the A.D.D. and an especially valuable tool to encourage the A.D.D. child to accept responsibility for their work. The homework contract clearly states that when the homework is completed, the child will earn a reward. The contract also clearly outlines consequences for not completing homework. You can offer daily modest rewards like earning time to play Gameboy, the right to choose a favorite dinner or a modest treat or special privilege. Or, you can develop a point system for larger weekly rewards. You can give out one point for every night of completed homework for the child to cash in for a trip to the zoo after earning five points, for instance. Effective consequences for not completing homework are losing phone, computer, stereo and television privileges for the evening. To add a little more discomfort to the situation, have the child stay inside for the evening without friends. It is important that you remain calm, firm and consistent on nights when Attention Deficit Disorder child decides to get into a power struggle over homework. It may take a couple consequence days before the child realizes that completing homework makes for a better night than not doing homework. It is also important that you reward for effort and not just grades for the A.D.D. child. The goal is to develop a solid homework habit. With a homework habit established, better grades will automatically follow. Don't forget to offer the intangible rewards of smiles and praise when your child puts the effort into completing his homework. A "way to go" goes a long way in positive reinforcement for Attention Deficit Disorder children. _ Using an assignment book for the A.D.D. child helps parents keep track of the child's daily and weekly homework. If the teacher does not use an assignment book, develop a system with the teacher so you know the child's homework assignments. _ If the A.D.D. child insist on heavy parental homework help, require that the child attempt problems at least twice before asking for homework help. They may need homework help, but make sure he puts a genuine effort into solving the problem first. _ Attention Deficit and hyperactive children may not be able to receive "A"s on every homework and school assignment. Instead of getting hung up on the traditional grading scale, give you’re A.D.D. child an "A" for effort. "Adolescent girls with ADHD frequently develop body-image dissatisfaction and may go through repeating cycles of binge eating and purging behaviors that are common in bulimia nervosa," said University of Virginia psychologist Amori Yee Mikami, who led the study. The findings appear in the current issue of the Journal of Abnormal Psychology. ADHD is a disorder that affects about 5 percent of school-age children, and three times more boys than girls. Symptoms include a short attention span, poor organization, excessive talking, disruptive and aggressive behavior, restlessness and irritability. Many children with ADHD suffer through a range of problems, from poor grades to poor relations with parents and teachers, and more than half have serious problems making friends. Because the disorder is far more common in boys, researchers are still learning its long-term effects on girls. "Our finding suggests that girls may develop a broader range of problems in adolescence than their male counterparts," Mikami said. "They may be at risk for eating problems, which are a female-relevant domain of impairment. We know that eating disorders occur 10 times more often in girls than boys." Additionally, Mikami noted that because ADHD is more common in boys, many girls with the disorder may go undiagnosed and untreated. "Girls with ADHD may be more at risk of developing eating problems as adolescents because they already have impulsive behaviors that can set them apart from their peers," Mikami said. "As they get older, their impulsivity may make it difficult for them to maintain healthy eating and a healthy weight, resulting in self-consciousness about their body image and the binging and purging symptoms." The study was conducted with an ethnically diverse sample of 228 girls in the San Francisco Bay area; 140 who had been diagnosed with ADHD and 88 matched comparison girls without ADHD. They were first assessed between the ages of 6 and 12 and again five years later. Girls with the "combined type" of ADHD (those with both inattention and hyperactivity/impulsivity) were most likely to have adolescent bulimia nervosa symptoms, relative to girls with the "inattentive type" of ADHD (those with inattention only) and girls without ADHD. Girls with both types of ADHD were more likely to be overweight, to have experienced harsh/critical parenting in childhood, and to have been peer-rejected than girls without ADHD. Mikami said she believes these factors could contribute to the bulimia nervosa symptoms. "An additional concern is that stimulant medications used to treat ADHD have a side effect of appetite suppression, creating a risk that overweight girls could abuse these medicines to encourage weight loss, though we have not yet investigated that possibility," Mikami said. She warned parents and teachers to be aware that adolescent girls with ADHD may develop an array of female-relevant symptoms beyond the standard ADHD symptoms, to include eating disorders, depression and anxiety. The following books were helpful resources in the writing of this document. Many other informative books can be found at any good bookstore, on a website that offers books for sale, or from the ADD Warehouse catalog. Taking Charge of ADHD , by Russell A. Barkley, PhD. New York: The Guilford Press, 2000. ADHD: Attention-Deficit Hyperactivity Disorder in Children and Adults , by Paul H. Wender, MD. Oxford University Press, 2002. Straight Talk about Psychiatric Medications for Kids , by Timothy E. Wilens, MD. New York: The Guilford Press, 1999. 1Still GF. Some abnormal psychical conditions in children: the Goulstonian lectures. Lancet , 1902;1:1008-1012. 2DSM-IV-TR workgroup. The Diagnostic and Statistical Manual of Mental Disorders , Fourth Edition, Text Revision. Washington, DC: American Psychiatric Association. 3Consensus Development Panel. Defined Diets and Childhood Hyperactivity . National Institutes of Health Consensus Development Conference Summary, Volume 4, Number 3, 1982. 4Wolraich M, Milich R, Stumbo P, Schultz F. The effects of sucrose ingestion on the behavior of hyperactive boys. Pediatrics , 1985; 106; 657-682. 5Hoover DW, Milich R. Effects of sugar ingestion expectancies on mother-child interaction. Journal of Abnormal Child Psychology , 1994; 22; 501-515. 6Biederman J, Faraone SV, Keenan K, Knee D, Tsuang MF. Family-genetic and psychosocial risk factors in DSM-III attention deficit disorder. Journal of the American Academy of Child and Adolescent Psychiatry , 1990; 29(4): 526-533. 7Faraone SV, Biederman J. Neurobiology of attention-deficit hyperactivity disorder. Biological Psychiatry , 1998; 44; 951-958. 8The ADHD Molecular Genetics Network. Report from the third international meeting of the attention-deficit hyperactivity disorder molecular genetics network. American Journal of Medical Genetics , 2002, 114:272-277. 9Castellanos FX, Lee PP, Sharp W, Jeffries NO, Greenstein DK, Clasen LS, Blumenthal JD, James RS, Ebens CI, Walter JM, Zijdenbos A, Evans AC, Giedd JN, Rapoport JL. Developmental trajectories of brain volume abnormalities in children and adolescents with attention-deficit/hyperactivity disorder. Journal of the American Medical Association , 2002, 288:14:1740-1748. 10Wender PH. ADHD: Attention-Deficit Hyperactivity Disorder in Children and Adults . Oxford University Press, 2002, p. 9. 11Geller B, Williams M, Zimerman B, Frazier J, Beringer L, Warner KL. Prepubertal and early adolescent bipolarity differentiate from ADHD by manic symptoms, grandiose delusions, ultra-rapid or ultradian cycling. Journal of Affective Disorders , 1998, 51:81-91. 12The MTA Cooperative Group. A 14-month randomized clinical trial of treatment strategies for attention-deficit hyperactivity disorder (ADHD). Archives of General Psychiatry , 1999;56:1073-1086. 13Wilens TC, Faraone, SV, Biederman J, Gunawardene S. Does stimulant therapy of attention-deficit/hyperactivity disorder beget later substance abuse? A meta-analytic review of the literature. Pediatrics , 2003, 111:1:179-185. 14Barkley RA. Taking Charge of ADHD . New York: The Guilford Press, 2000, p. 21. 15U.S. Department of Transportation, National Highway Traffic Safety Administration. State Legislative Fact Sheet , April 2002. 16Silver LB. Attention-deficit hyperactivity disorder in adult life. Child and Adolescent Psychiatric Clinics of North America , 2000:9:3: 411-523. 17Wender PH. Pharmacotherapy of attention-deficit/hyperactivity in adults. Journal of Clinical Psychiatry , 1998; 59 (supplement 7):76-79. 18Wilens TE, Biederman J, Spencer TJ. Attention deficit/hyperactivity disorder across the lifespan. Annual Review of Medicine , 2002:53:113-131. 19 Attention Deficit Disorder in Adults . Harvard Mental Health Letter, 2002:19;5:3-6.